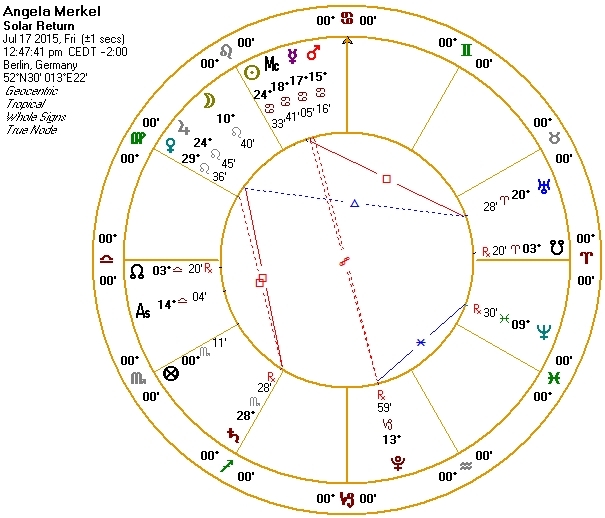 In late 2014 I wrote a profile “Angela Merkel and ‘This Wall” (PDF) that discussed Merkel’s life, her natal chart, and the astrological indicators relevant to the fall of the Berlin Wall and her subsequent career as a politician. Her year 2015 brought her to new prominence on the international stage. Diplomatically she has become a third factor in the increasingly adversarial relationship between the United States and Russia; she received much criticism for her brinkmanship with Greece as it was defaulting on debt repayment and contemplating leaving the Euro-zone; most recently she has opened the borders to waves of people fleeing Syria and Iraq. Her welcoming attitude toward those wanting to immigrate to her country earned her and her country considerable praise around the world – and some opposition in her own country. What’s her astrology like these days? Her transits show Pluto retrograding toward an opposition to her natal Jupiter but never quite gets there. More relevant may be Jupiter’s arrival into Virgo and her Tenth House and making a conjunction to her Venus in Virgo in early September when the refugee crisis began to take the markings of a major humanitarian crisis – one that she has prevented so far. Venus in Virgo demonstrates that the Jupiter transit is not an outpouring of idealism but based on calculation. In so doing, however, she may have changed the history of her nation. 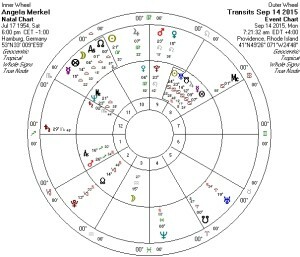 Transiting Uranus will impact Merkel’s Midheaven and Sun but not until next year – she may have more surprises, or more surprises will happen to her. Saturn, now moving into Sagittarius and her First House, may restrict her options due to an increasingly powerful domestic opposition. But not yet. Her secondary progressions have one aspect perfecting itself: Venus in Scorpio, departing from Saturn, in sextile to Mars in Capricorn. This may help put Venus to practical use. We are beginning to see a focus on Venus. Here’s her solar return for 2015 and it’s hard not to notice that most planets inhabit the Tenth and Eleventh Houses that, for a national leader, impacts not only her own prominence but her standing among other world leaders. The “Ruler of the Year”, the planet who governs her profected Ascendant, is Jupiter in Leo and in the Eleventh House, its “House Joy”. 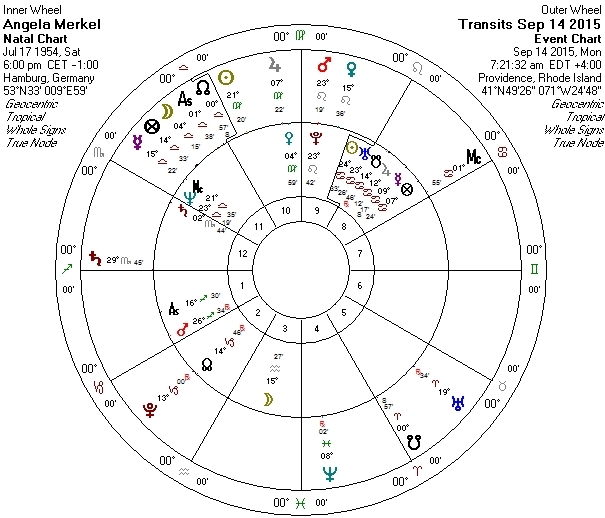 Uranus makes aspects to both Jupiter and Sun and makes Merkel capable of all kinds of surprises. She’s by no means finished with them. A quick look at her Hellenistic predictive indicators gives us even more information about this time in her life. For more importation about Hellenistic predictive techniques, see my book: Astrological Roots: The Hellenistic Legacy, Chapters 12-14. Her Decennials that were Mars-Mercury in 1989 are now Mercury-Mars, meaning this is a particularly Mars time within a longer Mercury period. Mars is, of course, in her First House and in Sagittarius and rises to prominence when she takes personal initiative, something she’s been more comfortable with lately. “Circumambulations” are a form of primary directions and an ancestor of secondary progressions and have been doing interesting things in Merkel’s chart and life. When by this kind of direction a directed position aspects a natal planet, that planet becomes a dispositor for that area of life. Directing Merkel’s Sun shows Venus taking over in September 2013; directing her Ascendant, Venus took over March 2015. Added together they imply strong use of Venus in Virgo – the scrap with Greece seems to have brought about the impersonal nature of Venus in Virgo; her decisions regarding immigrants remind us that it’s still Venus. As a Tenth House planet activity of Venus will indicate more public exposure than is usual for her. “Zodiacal Releasing” from Fortune goes through signs (and thus their planetary rulers) and give longer-range general planetary rulers and shorter-range specific rulers. From September 2013 the signs involved were Virgo-Leo and that period was over in March of this year. Instead of the next signs being Virgo-Virgo and thus going back to the beginning, “Loosening the Bonds” occurred and the specific planet would be found not in Virgo but its opposite sign Pisces! We don’t know the justification for such a move but I’ve seen it work to indicate important changes in a person’s life. Pisces is the sign of the Fourth House of home (and for a national leader one’s “homeland”) but, more importantly it seems, Pisces is also governed by Jupiter that is exalted in Cancer in her natal chart and suggests themes of expansion, wider inclusion, and the like. This will continue until March 2016 and then we get an infusion of Mars with Virgo-Aries. Stay tuned!